To introduce personal experience of how to edit and combine video/audio clips from music DVD to an intact video file, so that we can playback them on Computer and ISO/Android/Windows RT/Pro tablets. Bruce Springsteen & the E Street Band – Live in New York City; Born To Run: 30th Anniversary; Jeff Buckley – Live in Chicago; U2 – Zoo TV Live from Sydney; Paul Simon – You’re the One (In Concert from Paris); Joni Mitchell – Shadows and Light; The Up in Smoke Tour, etc. Which ones you already got? Collecting best convert DVDs has been my hobby. Usually I wish to enjoy these video/audio on computer, tablets or only need the audio so that I can take with everywhere. However we all know these commercial DVDs are protected from transferring. That’s totally understandable but still making things rather inconvenient: you cannot take a DVD player or pc everywhere. After several trials, I’m able to extract pure audio files from convert music DVD or combine all the songs into one intact video so that I can playback easily on computer or tablets; the combined video works perfectly without any synchronization problem. Many of you may already know this but still I’d love to share my experience here. 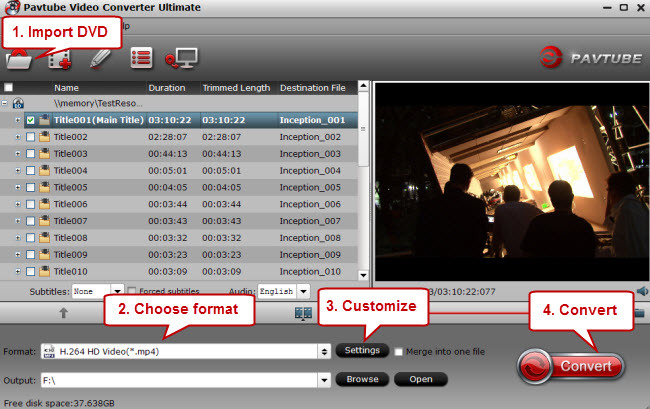 To roll video&audio off DVD, the first step is to use a tool to decrypt the contents; then convert them to your wanted video/audio formats with all kinds of compatible settings. This time I tried with Pavtube Video Converter Ultimate which support both DVD/Blu-ray ripping and video converting; and it appears to be the best app I’ve ever meet. After that, let’s find the drop-down list besides “Format” and “Settings”, hit it to choose format. Usually the default video settings should meet most of your requirements. But if you want to change video size, bitrate, frame rate and other audio specs, hit the “Settings” to have a try. Ok, things are ready. Oh for people who want to combine all the songs into one file, check the titles and click “merge into one file” (you can find besides “Settings”). All the checked music files will be merged into one intact file and you can enjoy them seamlessly. The last thing you need to do is hitting the big red “Convert”. Wait for a while during the program converting music DVD to MP4 format. What I’d like to mention is that the conversion speed is much related with your target file size&settings, computer configuration and other programs running simultaneously. After it completed, hit the “Open” or “Open output folder” to quick locate the generate file. How to watch Blu-ray/DVD movies (Folder and ISO files) on Surface 2? How to rip Blu-ray to H.264 MP4 video using Handbrake or Pavtube?